...and there's even a quilt waiting to be quilted for at least a week now. But! I don't mind....because life has been busy with family, friends and gift giving all the projects I've been working on! My daughter and son-in-law LOVED their Dinosaur Baby Quilt with matching receiving blankets and burp rags. Their sister-in-law was grateful for her Dr. Seuss Receiving Blanket. This truly is the most rewarding part for me: watching people open their gifts with awe and appreciation. I love that I left all of them a little piece of me to keep warm under. This week continues to fill our life with family visits as my parents are here from Arizona for a week! So on top of teaching school and their visit, not much sewing will get done. But, my youngest daughter is home for a few more weeks before she heads back to college. She wants to help me make a picnic quilt before she leaves to match this really cool picnic basket she found while we were away one weekend! We are planning to make a quick pinwheel quilt from the above fat quarters. We'll keep ya posted on the progress. Wishing everyone a Happy Labor Day! The best delays are the ones that include family! Your daughter's quilt will be pretty with those pretty fabrics in it...perfect for that basket. Definitely keep us informed. Yeah working really gets in the way of our quilting obsession doesn't it LOL, but at least you are finding time to get into the studio and onto the blog occasionally! 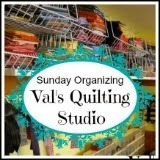 Well Val I think you have a wonderful quilting studio that looks like a very creative person lives there! I love being organized but there are times when I walk into my messy quilting studio and office (I have an accounting business) and it is pure bliss even though it is piled high with creativity bouncing everywhere you look!